Kanagawa is a Japanese prefecture of the Greater Tokyo Area. In the early 19th century (late Edo period) master painter Katsushika Hokusai caught the beauty of this region in a series of landscape prints called “Thirty-six views of Mount Fuji”. “Under the wave off Kanagawa” is the most famous single image in this series. It depicts 3 boats threatened by a rogue wave, with Mount Fuji in the background. Impressions of this painting can be found in many Western collections, for example in the Metropolitan Museum of Art. But even without ever entering a museum this iconic image is probably familiar to you. My love for Japan (it’s my number one dream destination!) 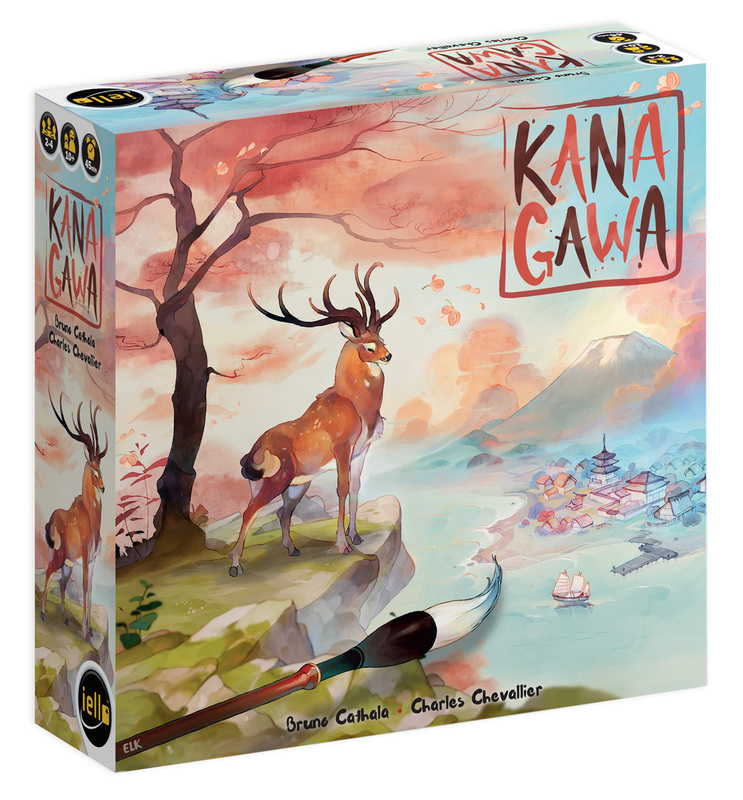 and appreciation of this painting caught my interest for Kanagawa (the board game) by designers Bruno Cathala and Charles Chevalier. In Kanagawa players are loyal disciples of Master painter Hokusai, attending classes at his renowned painting studio. Through the Master’s teachings players develop their painting skills and strive to become his best apprentice. Each player works on his own landscape series and tries to create a harmonious print that rivals the talent of their Master. The aim of the game is to collect the most harmony points by means of card drafting and set collection. Kanagawa is played with a neat deck of multi-use lesson cards that can become part of your print (right side) or improve your studio (left side). Players acquire those cards during a drafting phase that simulates the Grand Master passing on his knowledge. Each round lesson cards equal to the number of players are placed on the bamboo school board. Beginning with the start player and in clockwise order players decide then to grab lesson cards or pass. New cards get added for the players remaining at school. Grabbing that one useful card early is tempting, but attending class longer results in a bigger hand of cards which might broaden your scoring options in the long haul. In the next phase players need to use all of the acquired lesson cards. To paint a print you need to be properly skilled and have enough paint brushes and available actions. By adding cards to your studio that hold paint slots, brushes and move actions (I imagine these “moves” are brush strokes) you try to meet these requirements. Wisely selecting which cards to use for your studio or print and playing them in the optimal order is a gratifying individual puzzle, though never a brain burner. The element that makes the puzzle more interesting to me is the strife between players for the Assistant pawn. Whoever is holding this pawn at the end of the round becomes start player in the next drafting phase. You acquire the Assistant by placing a card with the assistant symbol in your studio last. So leaving school late gives you not only more cards, but also a bigger chance to get first pick in the next round. At the end of the game one harmony point gets awarded for every print in your landscape series, and you score an extra point for each card in your longest consecutive seasonal run. Some cards have extra harmony points printed on them too. But obtaining diplomas by painting sets of main subjects or collecting sets of studio equipment is necessary to really boost your score. Furthermore they provide nice bonuses. The diploma tokens are splayed out on the table per category in ascending order. Immediately upon qualifying for a diploma you need to decide whether to seize it or not. When feeling lucky you can continue building up for a more difficult diploma in that category. Surpassed diplomas however become forever unavailable to you. Once the lesson card deck is empty or one or more players have 11 cards in their print the game is finished and harmony points are awarded. 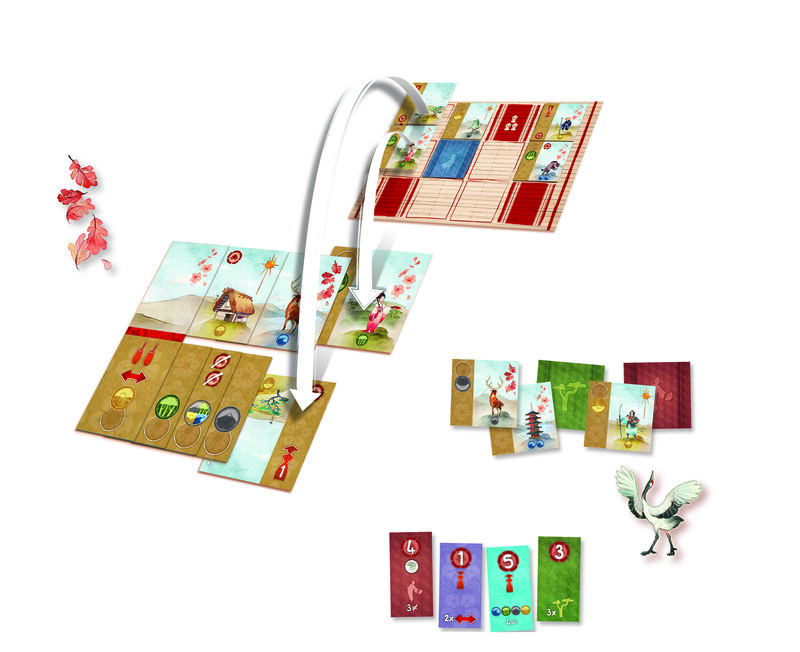 Kanagawa is an easy-going game that combines high aesthetics with solid mechanics. For the small box and limited components it offers many modern game mechanisms like card drafting, press-your-luck, tableau building and set collection. Despite all these positive features I found the game to be tedious rather than thrilling. The most exciting part of the puzzle, the struggle between players over the Assistant pawn, sadly breaks the rhythm of the game. This ownership can’t be followed up correctly when everybody plays simultaneously. So you’re forced to wait while other players lay out their puzzle. I also feel that luck needs to be on your side to be able to collect a big enough set for a high diploma. Most often the game ends too soon. Neatly tucking the lesson cards underneath each other, while avoiding knocking over your paintbrushes, turns into a fiddly process very soon too. But to behold your completed print at game’s end gives a nice sense of accomplishment. My fondness for the Japanese culture and the splendid soft toned artwork will make me return to this game, but I don’t consider it a must-have. Light strategic decision making, medium player interaction and short gameplay make it an accessible game for a wide public. The thematic take on the rulebook makes learning the game just a tiny bit complex. But when you start playing it all becomes clear. Yeah, sadly, aside from gorgeous production all i hear around that the game is lacking. Sometimes “wanting to like” a game just isn’t enough.. It’s not bad, just not a game a would ever pick of a gaming shelf like “hey, let’s play this one!”. In my collection it would gather dust.